The Ducati Streetfighter easily found its way onto my top 10 greatest motorcycles of all time list. Maybe even top 5. So whenever I hear someone has decided to try and customize it I cringe like someone is causing me physical pain. It rarely works out, if ever. Sometimes though, a shop will surprise me. Smoked Garage has done just that, in a way that is particularly unexpected. Smoked Garage started as a one man shop, just Nicko Eigert and his first scooter. Through his tenacity, Smoked has grown to house 15 employees in Indonesia and Australia. 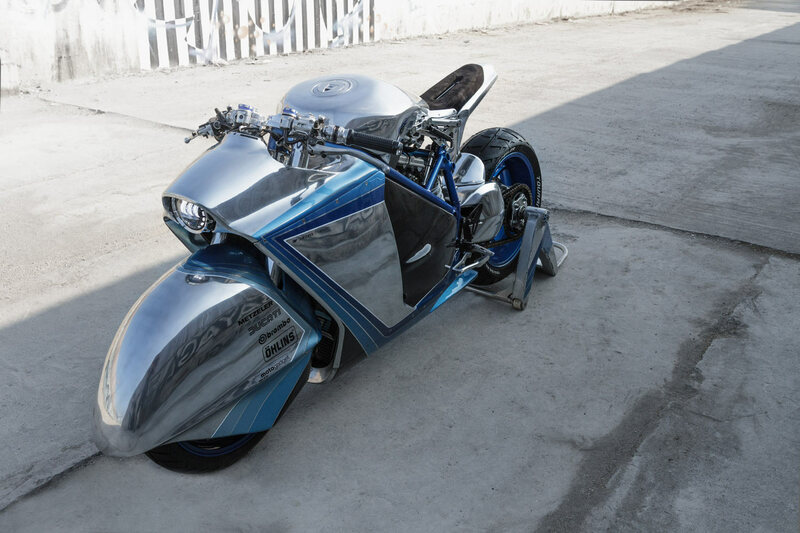 There isn’t a task they don’t do in-house, taking on all facets of building the ingenious motorcycles that come from their shop. This build is particularly true of that fact, but we’ll touch on that in a bit. Let us start with the obvious facts. 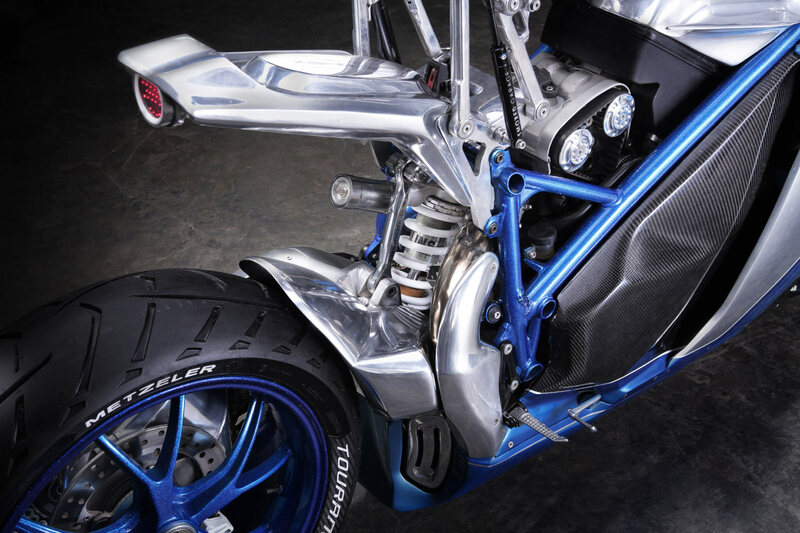 Yes, it is indeed a Ducati Streetfighter. 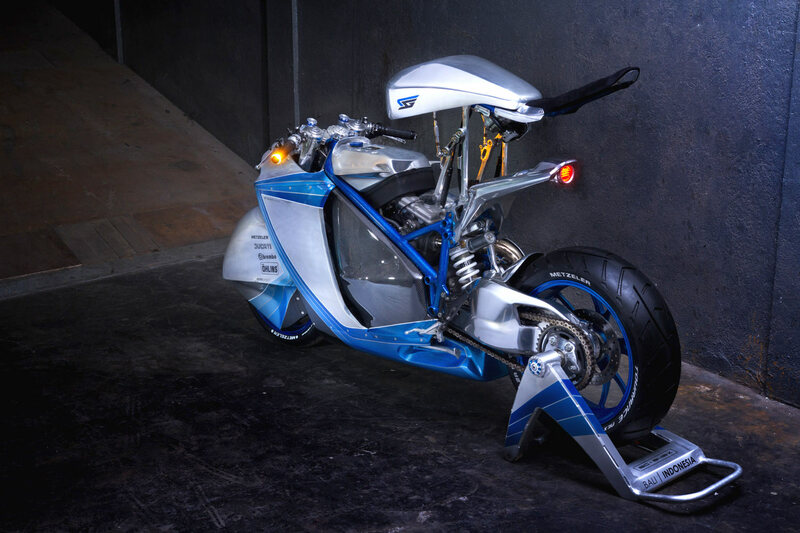 No, it doesn’t look anything like a Streetfighter. 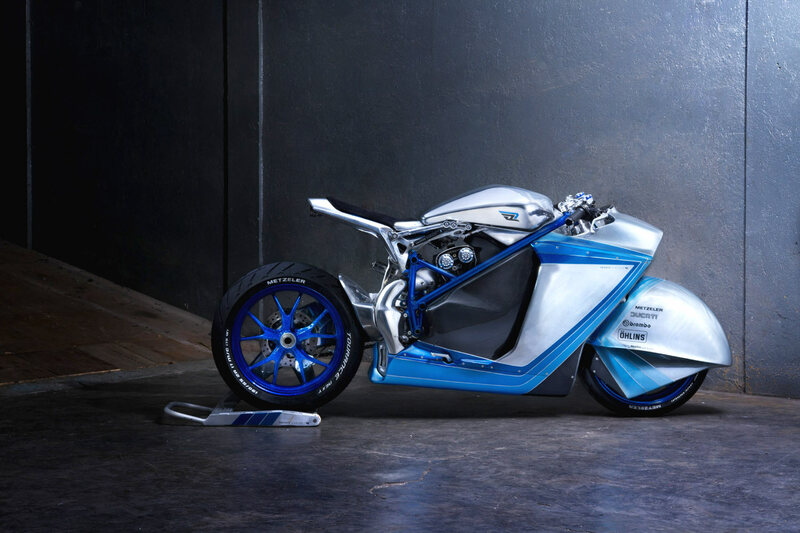 Smoked’s new body has completely transformed the Ducati into a shape never seen before. It’s not a ‘dustbin racer’ either. It really is as ‘one off’ as they come. 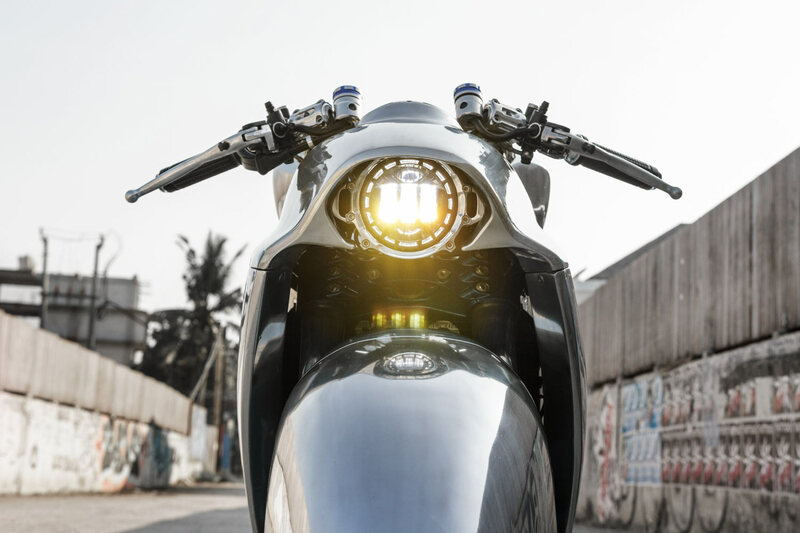 Thanks to an entirely new body the Ducati V-twin is no longer exposed, with only the rear cylinder peaking through to remind you exactly what is at the heart of this motorcycle. Regardless of how you feel about the styling, there is no arguing the massive amount of talent required to construct a body like this. The ‘SG-848X’ is the culmination of hard work from everyone involved at Smoked Garage, yet the body is likely the pinnacle of collaboration. Smoked set off to hand form the aluminum for this machine. First, they mocked up and sculpted some foam blocks to capture the design from their renderings. And yet that was the easy part. From there the team started hand forming the metal panels, beating them into shape. I say team because it took almost half of the garage for just this part. 7 men, working 12-hour shifts. And it still lasted a month straight. A testament to how complex this body really is. Even if it lasted years it would be well worth it. 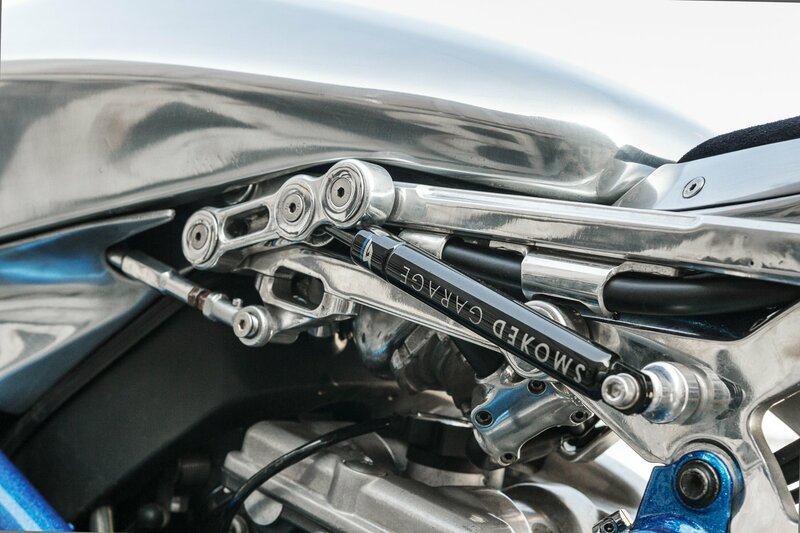 Every line is somehow an impeccable complement to the next, flowing perfectly over the front wheel and into the front side of the Ducati’s Trellis frame. If the hand formed metal wasn’t enough to cure your appetite of crafty bodywork then their next trick is perfect for you. Smoked wanted a futuristic touch to the ‘SG-848X’ so they elected to add carbon fiber panels to the mix, finishing off the bodywork on each side. While Carbon may not be a fiber of the future it does add a nice contrast to the complex metal work surrounding it. 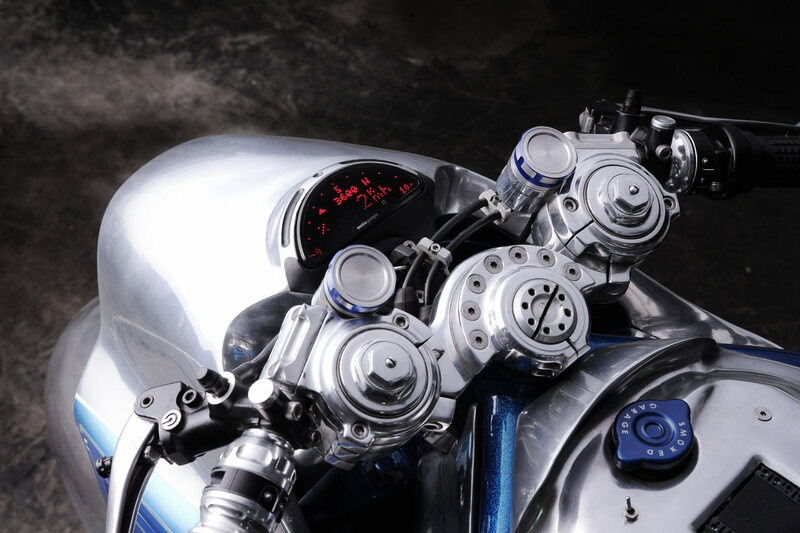 While the bike was coming along as planned, Nicko still wanted something to really push the machines boundaries, this came to fruition when they started working on the tank and rear subframe. While designing the tank and tail section Nicko had a revelation, this is where he could really showcase something different. 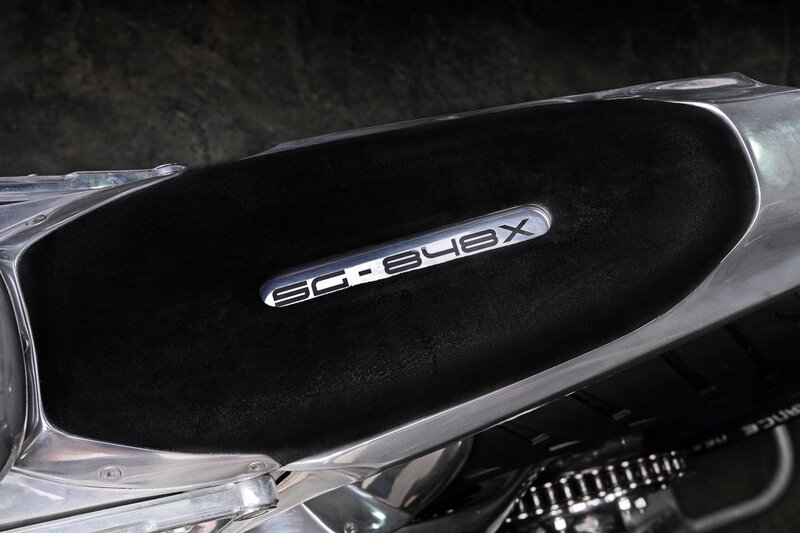 They started by creating a polished alloy cover for the airbox. 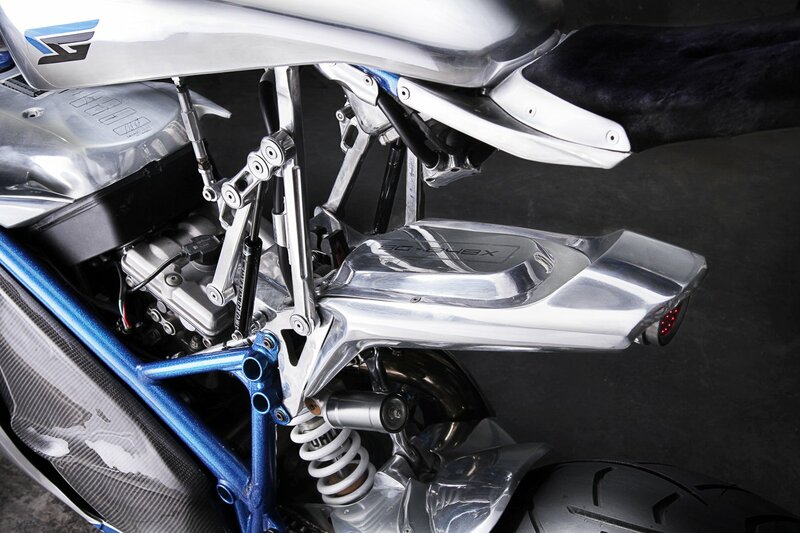 They then moved on to a building a completely custom rear subframe out of billet aluminum. 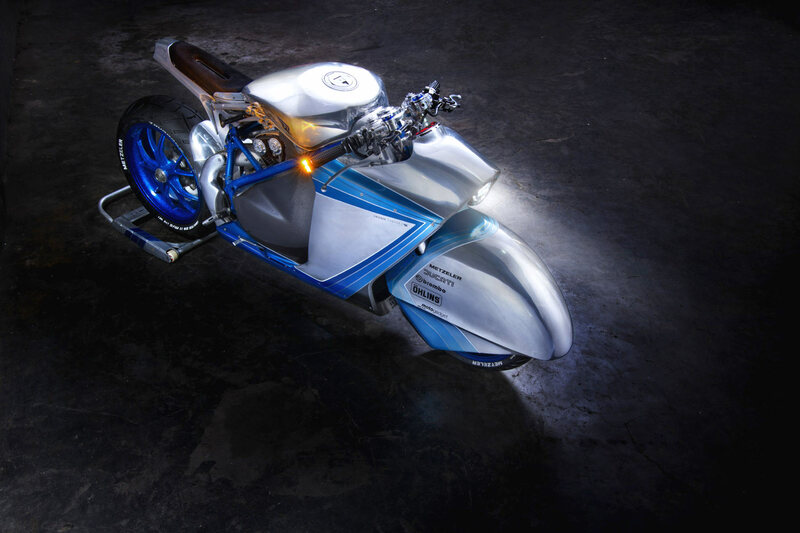 To take things to new heights they designed a new alloy gas tank and an innovative system that allowed the tank and seat to levitate over the frame that lies below. To accomplish this they fabricated a series of billet hinges and then paired them with a set of nitro shocks to allow it to actuate properly. Keep in mind, this is not a mock gas tank, it’s the real deal, with gas lines being lengthened to allow for its new articulation. An unusual concept, but fascinating none the less. While the body and levitating tank definitely steal the show, there is still so much more that the SG-848X offers. 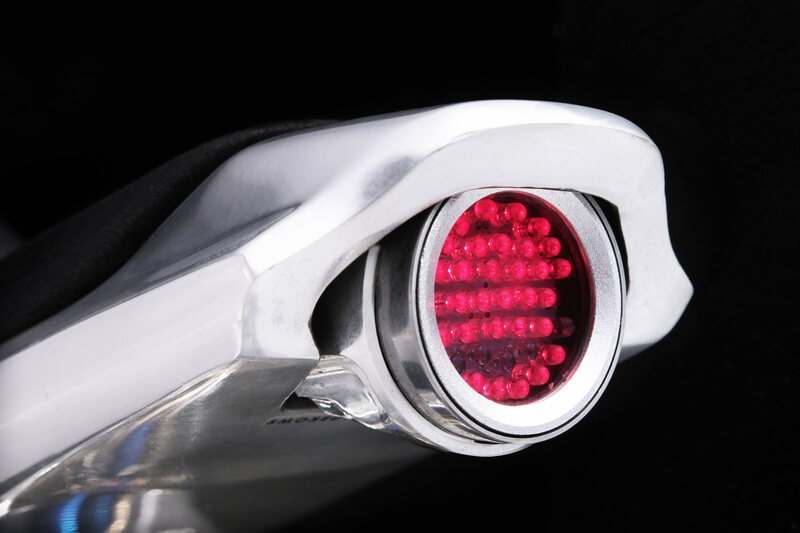 Smoked equipped LED lights front and rear to aid in its futuristic looks as well as LED turn signals mounted on as bar ends. To aid in the SG’s performance, Smoked built a custom top triple tree that is not only gorgeous but also stiffer than the stock unit. 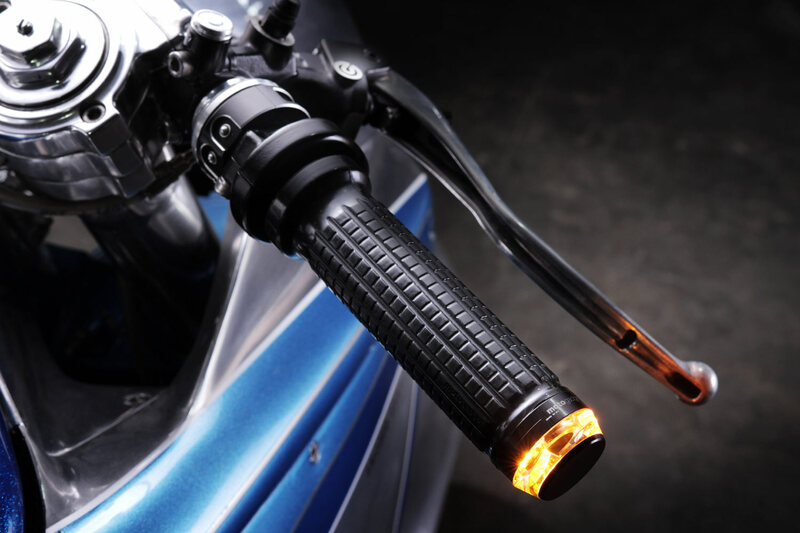 This also made room for Smoked to fashion some custom clip ons with built in brake and clutch reservoirs. The end result is both magnificent and functional. 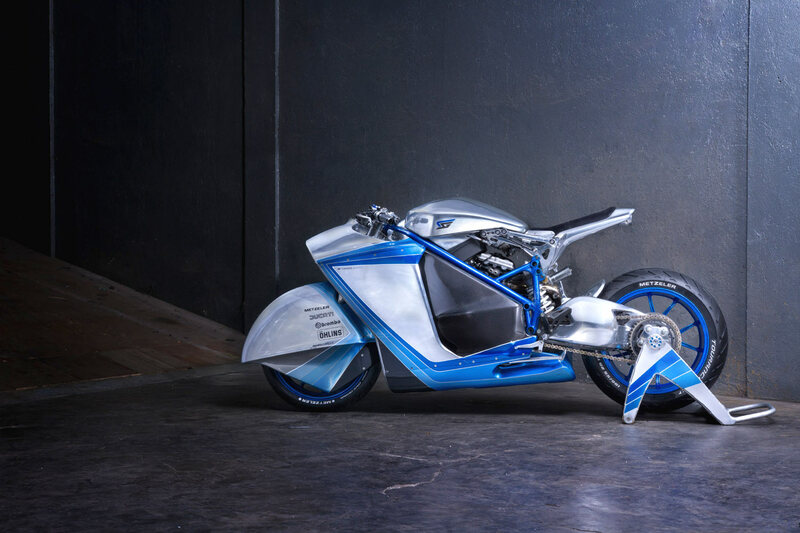 Molded into the front fairing a small data display resides as a sign that the electrical work is anything but stock. The display is a Motoscope Pro providing all the data anyone could possibly need, as well as signifying the work Smoked Garage put in to re-wire the entire machine with a Motogadget M-unit foundation. And with that, the final touch came in the form of paint. If you have ever painted metals before you are likely aware that it can be trickier to manage than other surfaces. It takes a lot of prep to make the paint adhere to the metal surface. That was no different for Smoked, except they had polished their bodywork to a mirror like finish while producing the epic bodywork. It required extensive work to get the paint to set and then was re-polished after the fact. A lot of work, but well worth the hassle. 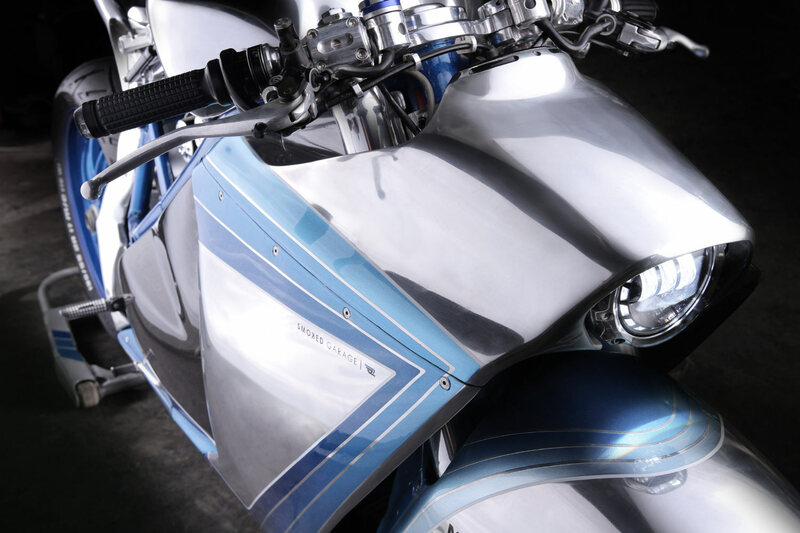 The final six shades of blue make the metal work appear even clearer, complimenting those body lines that took hundreds of man hours to create. The blue on the frame stands out beautifully while it accentuates the carbon that follows its every move. It’s a concept I am still attempting to wrap my head around. I would never have picked this motorcycle in a million years, especially when the donor bike is the amazing Streetfighter. It goes against everything I normally stand for and yet I find myself in awe. The level of craftsmanship is unprecedented, and with all the time that went into the ‘SG-848X’, not a minute was wasted. 9 months of meticulous work and Smoked Garage has turned my world upside down. It’s not a bike for my inner purist, yet I appreciate it more and more with every glance.